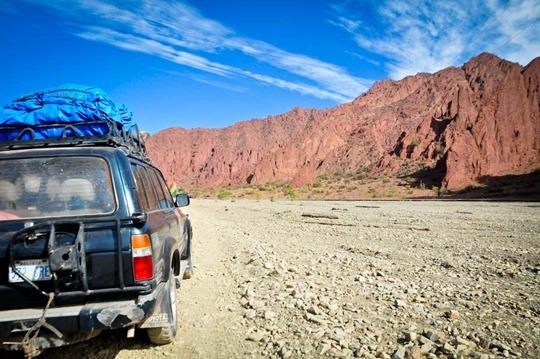 We spent four days in a jeep driving through the Bolivian outback! 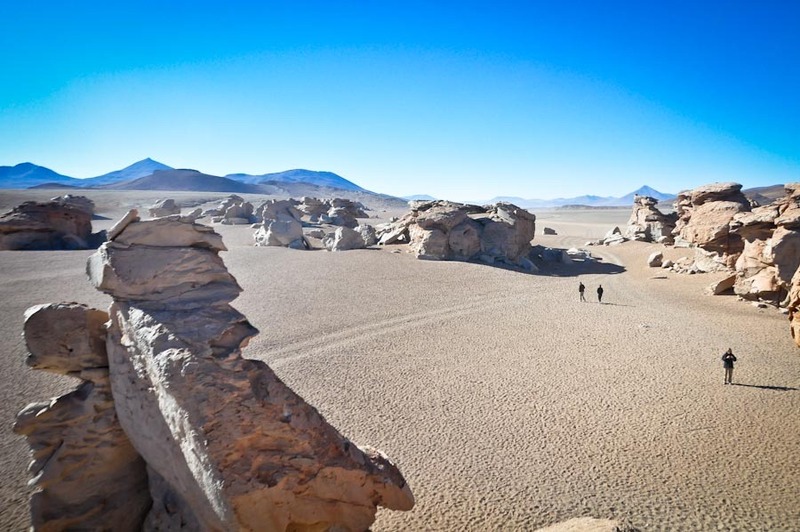 Most tourists do a 1-3 day tour from Uyuni. 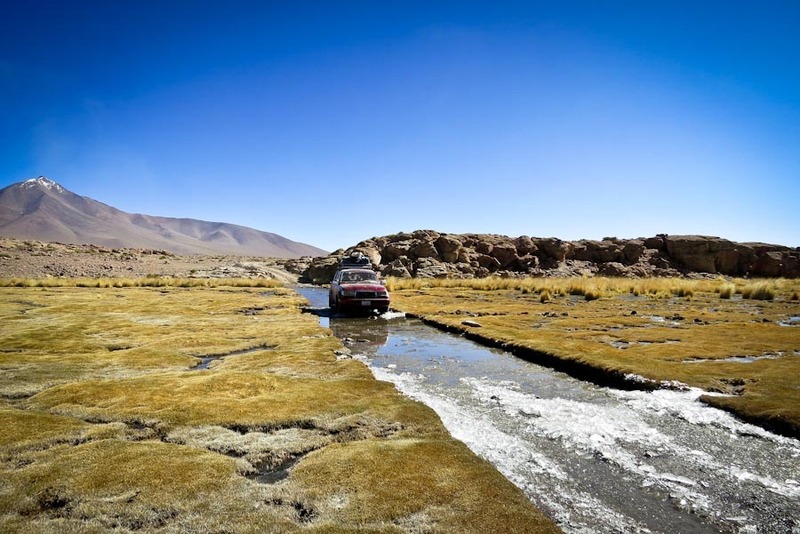 We took the road less traveled – a four day, 1,000km journey from Tupiza through the remote, uninterrupted and stunning scenery of Southwest Bolivia. It wasn’t all easy. We spent at least 10 hours a day cooped up in a jeep riding on bumpy, unrelenting dusty terrains. Pee breaks were often behind a low, non-shrubbery bush. By nightfall, temperatures drop drastically, no amount of layers seem to warm our chilling bodies. All of this at altitudes of 4,000+ meters. Oh, and did I mention, all while on my monthly cycle! TMI, I know, but despite all that, I would do it all again in a heartbeat (maybe without the menstrual cycle this time around..). 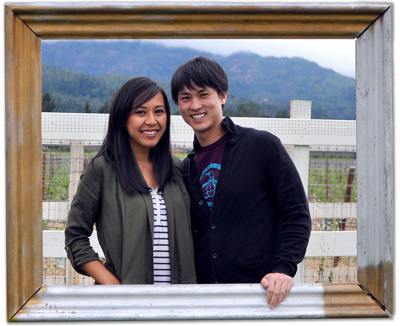 We hit the open road with a Kiwi couple, our driver and personal chef (yes, we got our own chef!). The canyons of Tupiza was our first stop. We’ve never been to the Grand Canyon, but I imagined it would look something like this – beautiful rock formations in shades of brilliant red and orange. As the day went on, the roads flatten out and I was amazed how our driver knew exactly where to drive. There wasn’t exactly a designated road, just dirt. We eventually made it to a little village like this one and called it a day. I consider myself a morning person but even I wasn’t loving our 5am wake up call especially after a cold and restless night. After breakfast, we made our way to an abandoned town called San Antonio de Lipez. From there, we paid to enter the Reserva Nacional de Fauna Andina Eduardo Avaroa and spent a majority of our day exploring the parks. For many, this was the closest thing to a shower of the 4-day trip. I had my own “issues” that prevented me from taking a dip. In any case there were no changing rooms and I was less than willing to strip down all my layers of clothing anyhow – it was quite windy. The hot springs was followed by a delicious lunch before we headed back out on the desolate road. Our drives consist of snow-top mountains and mirror lakes. I mean, it was just out of this world, the natural landscapes we passed were like canvas paintings or desert mirages, it didn’t look real. 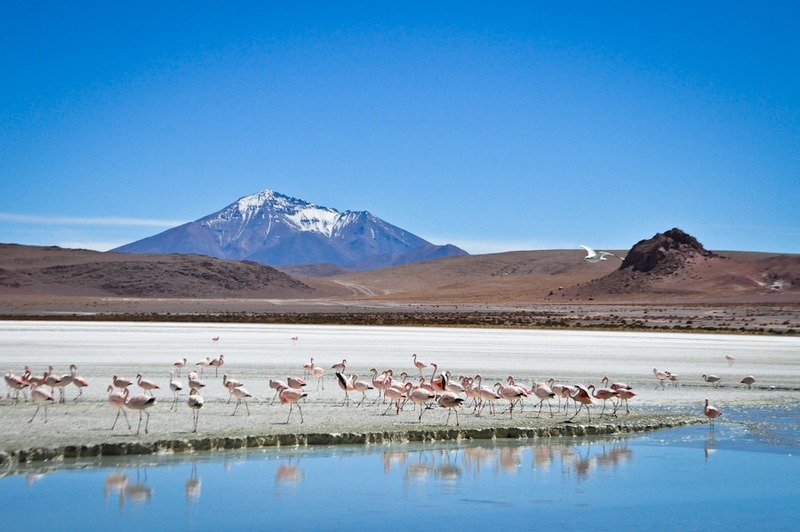 Day 3 was all about lagunas and pink flamingos and this cool stop that seem out of this world. 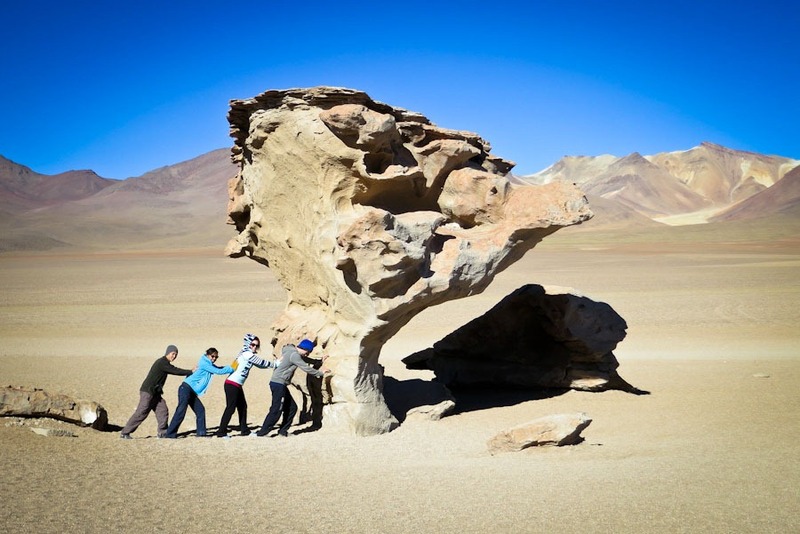 It’s my favorite stop: an area with isolated volcanic rock formations that has been shaped over time by strong wind. This rock is famous and looks like a tree, hence, it’s known as arbol de piedra or ‘stone tree’. I’m not one for heights but Gerard had a blast climbing the rocks. I just like looking at them. 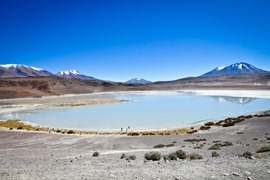 Laguna Celeste was one of five lagoons we visited on Day 3. 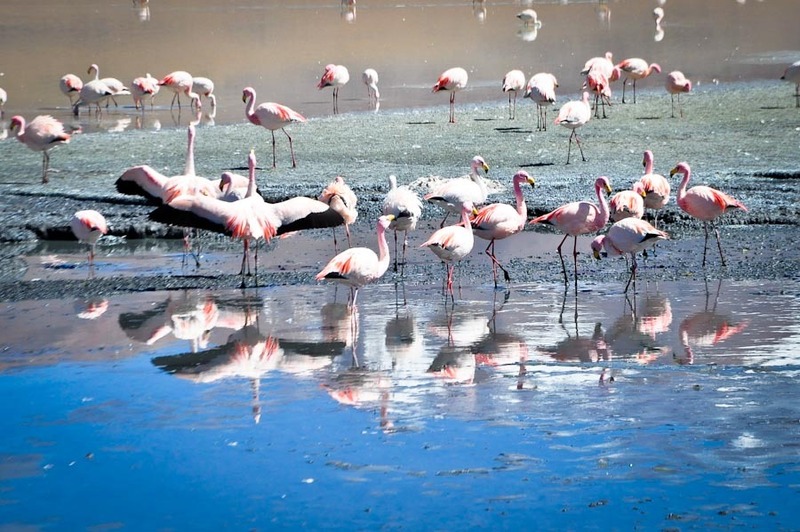 All are home to hundreds of Andean flamingos. I am obsessed with the colors of the pink flamingos against the desert brown, greenish shrubbery, white borax and the bluest of blue skies. 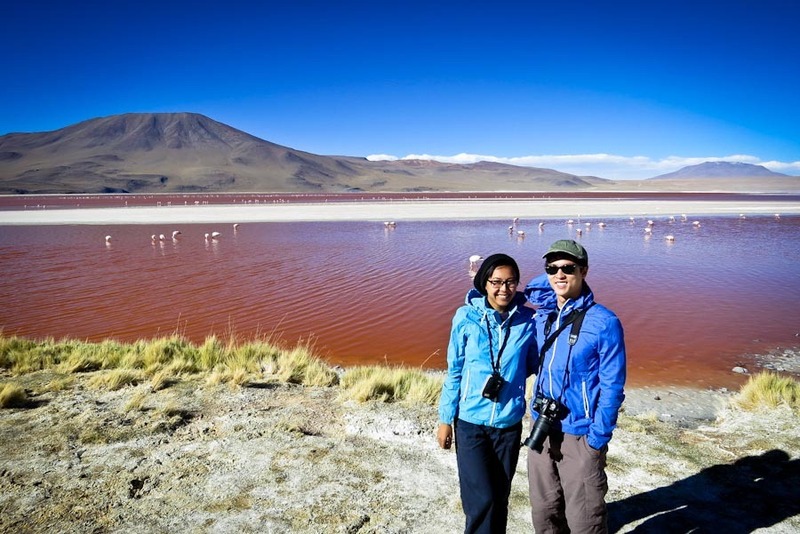 No photo editing required..
Here’s a first – a red lake. The water in this lagoon is red from algae pigmentation. 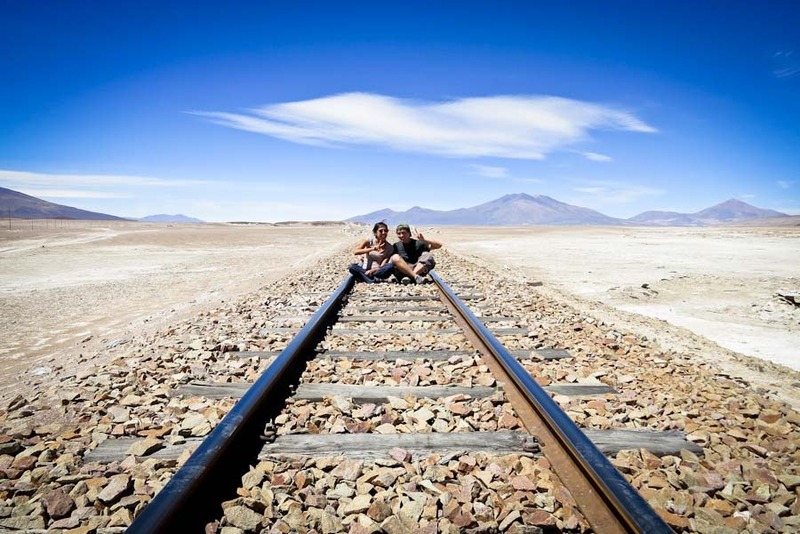 Throughout the 3-days, we made interesting and random stops at geysers, a once ocean-filled land now dried up and this one: an abandoned railroad tracks in the Atacama Desert. When our original accommodation fell through on our last night in the desert, we eventually ended up here and lucked out with private bungalows as cute as a button. 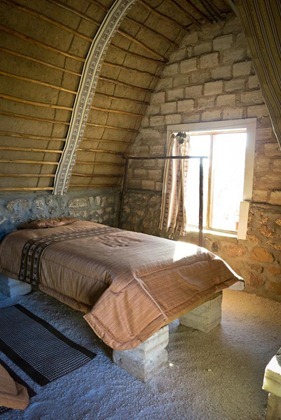 You can’t tell from the pictures, but the furniture in our room from floor to bed is made of salt! 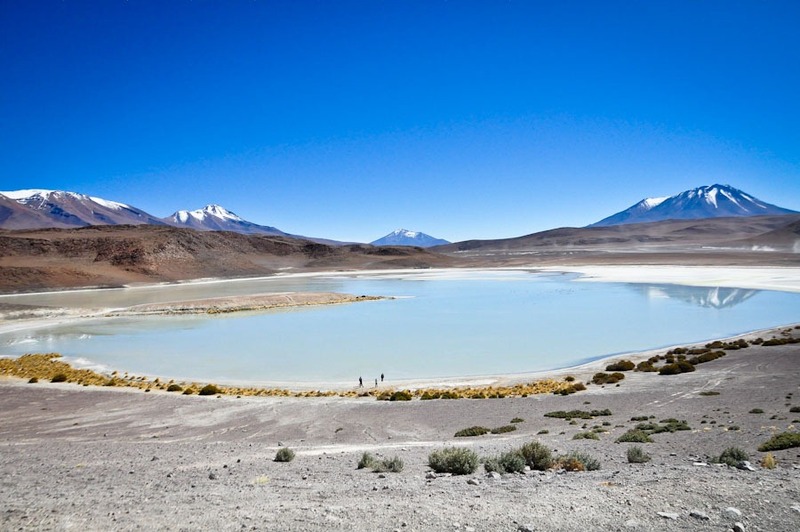 I was in awe at what we’ve seen thus far and we haven’t even made it to Salar de Uyuni yet! 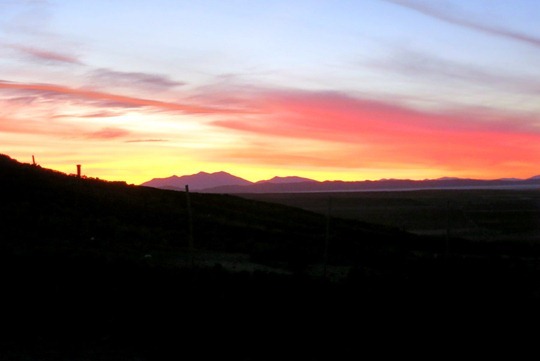 It’s some of the most beautiful scenery we’ve ever come across. Hard not to be amazed when you’ve got sunsets like this, right? 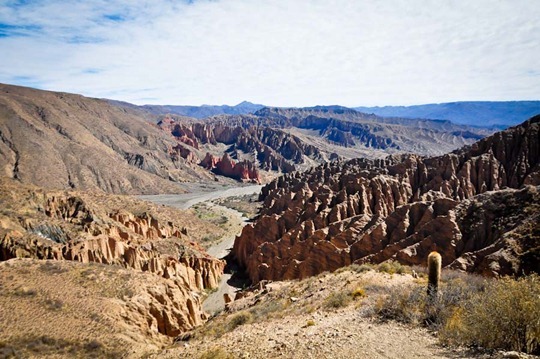 How to get here: We booked our bus ride, train tickets and Tupiza tour package in La Paz with Tupiza Tours. From La Paz, we bused to Oruro and took the overnight train to Tupiza. 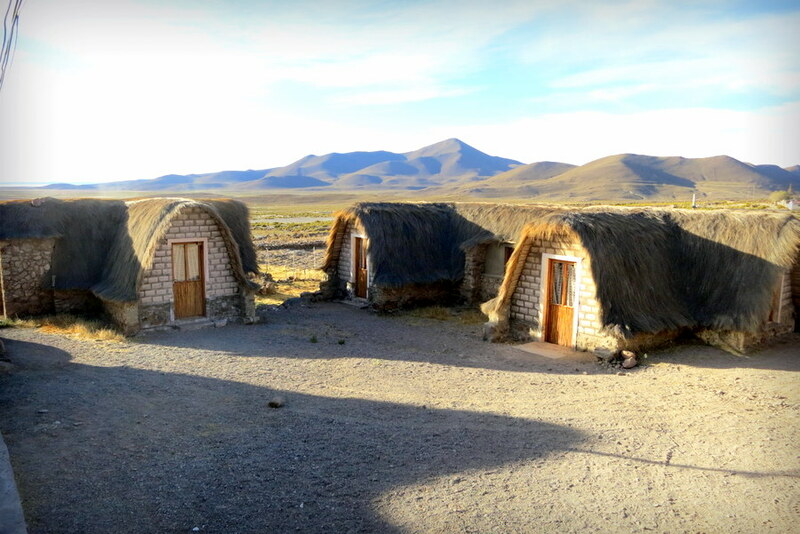 We stayed at Hotel Mitru, the same hotel Tupiza Tour operates from, and departed the next morning for our 4-day safari through the Bolivian outback to Uyuni. 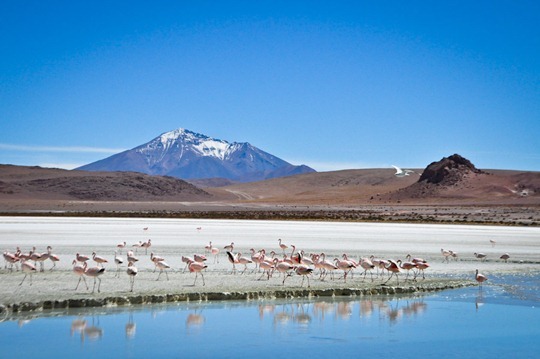 Have you toured Bolivia’s southwest circuit? Wow! 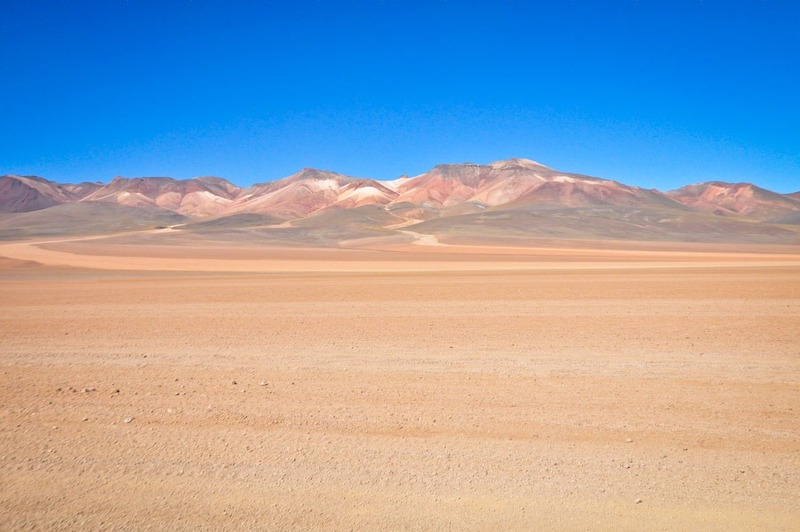 Desolate and simultaneously beautiful. Amazing! Beautiful photos. 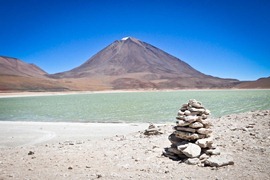 Bolivia sounds amazing and this is just the post I needed to prepare for our trip in June. Can’t wait for the next part. 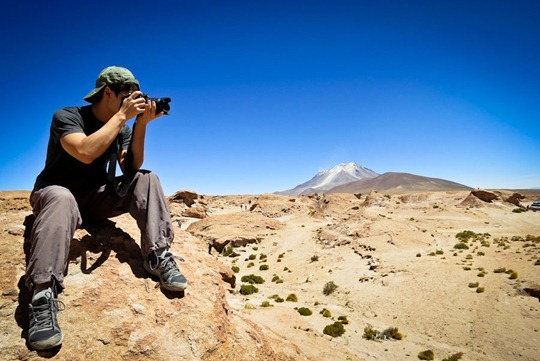 Do you recommend your tour company and how should I book our trip? It’s gorgeous! 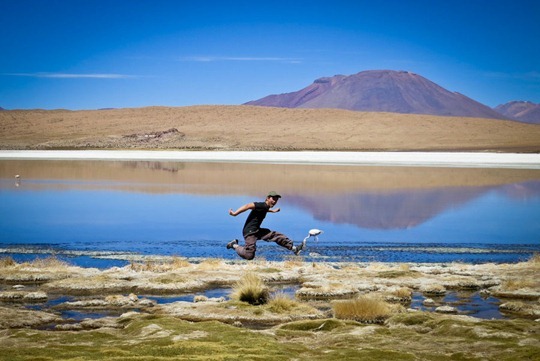 Bolivia is on my list! Can’t wait to read about the rest of your trip. Glad it’s on your list. 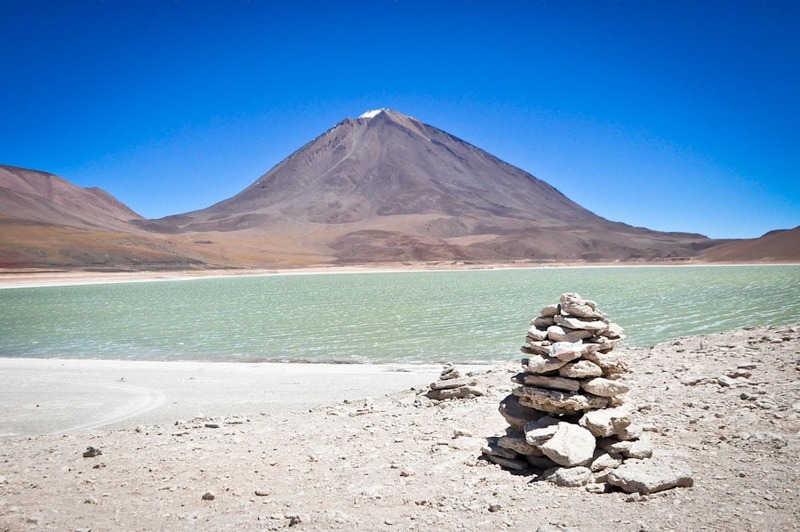 Bolivia is really a great underrated country to visit. So gorgeous. Oh my God! these pics are amazing… Absolutely stunning. I so want to go!! I know what you mean. The colors are ridiculous, right?! 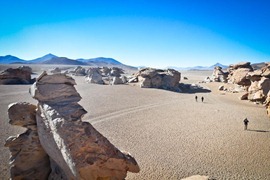 And with those landscapes, it’s whimsical and surreal. Have you been? You both really out did yourselves with this post. I want to do this and I’m going to need y’all to be my photographer. Awesome, my friends. Amazing photos and sharing. 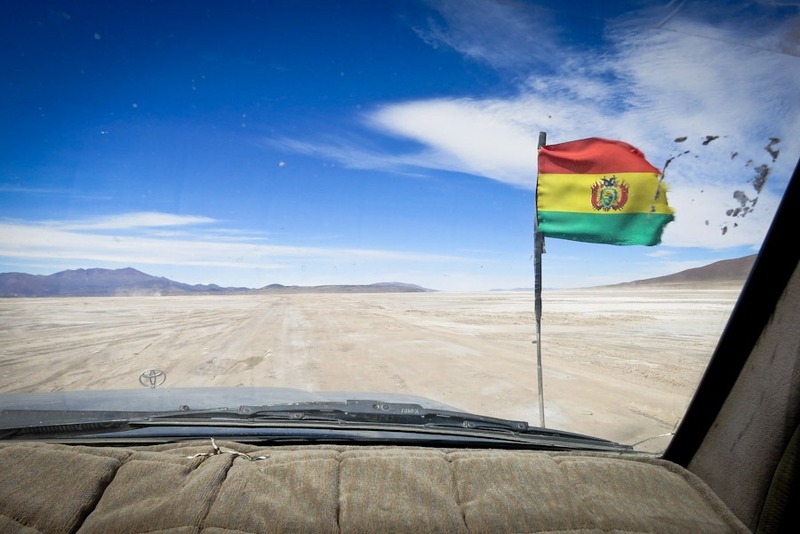 You’ve totally inspired me to put Bolivia on my list. Yay!! You won’t regret it. It’s such an underrated country. You’ll love it! I also hear that it’s cheap(ish), relative to other Central/South America destinations. Bonus! “Pee breaks were often behind a low, non-shrubbery bush.” – I know what this is like! 🙂 Okay, I seriously need to get to Bolivia! AMAZING! Hahaha, right?!! Lol, I knew you’d understand. not quite sure what i thought bolivia would look like, but i didn’t think it would be this. OBSESSED with the salt village! wanna go NOW! Add it to your rtw! Great photography! 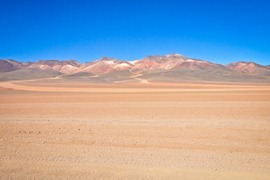 It reminds me of the Atacama Desert and its scenery. The 10-hrs/day rides on bumpy roads is something I’ve had to do a few times (tourism and work situations) and I never really get used to them! Glad you got to go and check out this corner of Bolivia. 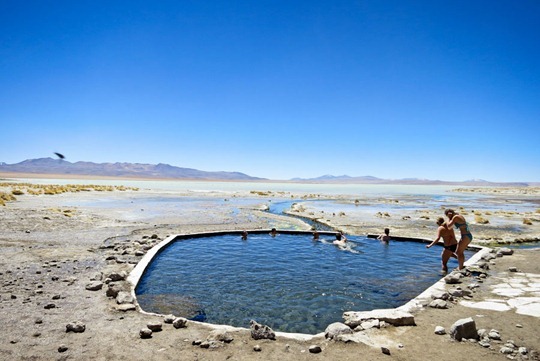 Very cool scenery, and I love the hot springs. What a cool destination. I’ve been wanting to visit the salt flats so bad lately! It looks amazing, and your photos are great! 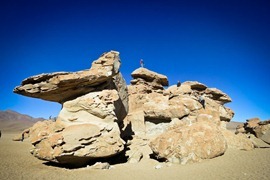 I love the rock formations, and the little huts you stayed in look adorable! Thanks Jenna. The rock formations are incredible in person. You should definitely go! those flamingos are too cute! 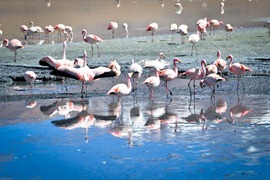 the only time i’ve seen flamingos were at the Flamingo in Las Vegas- haha. Would love to see them in their natural habitat! Will hopefully remember this place for the future! For us there weren’t any major delays with the bus/train combo. 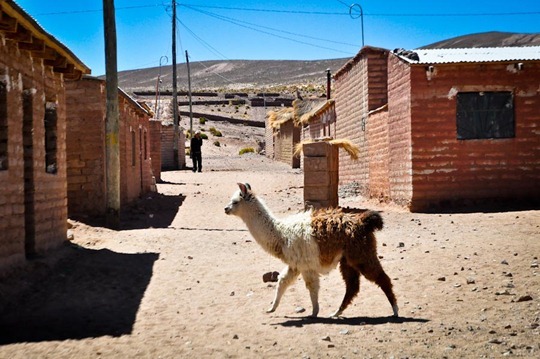 You just have to beware of protests that go on around La Paz. That seems to happen every now and then. When it does, it involves road blocks. Not good for people in transit. Have a blast!